One downtown Claremore building will have an all new look with a fresh coat of paint thanks to Claremore Main Street volunteers and Keep Oklahoma Beautiful’s Fresh Paint Days grant. Volunteers will gather on Monday (Sept. 17) evening to paint the outside of downtown’s centermost building, 409 W. Will Rogers Blvd. The store, formerly the Willow Tree Mall, is in the process of re-branding to the name Back in the Day. The “Paint Party” will begin at 5 p.m. and will go through 8 p.m. Supplies and dinner will be provided to volunteers, whether they’re able to give just an hour or stay for the duration. All are welcome. Additionally, each volunteer who signs in will be entered into a drawing to win a $50 gift card to Back in the Day. Claremore’s local Sherwin Williams store is a community partner, donating primer, paint supplies and t-shirts for all volunteers. The volunteer painters will be replacing orange and black paint with recycled, almond-colored H-I-S paint provided by the grant. 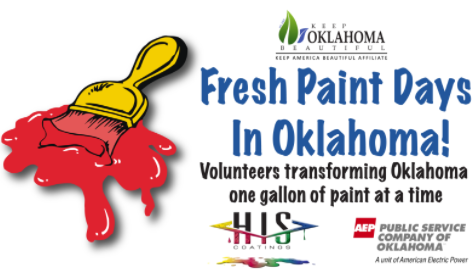 Fresh Paint Days is a program founded on the collaboration between H-I-S Paint and Keep Oklahoma Beautiful. KOB, with the help of sponsors, provides the paint and a stipend for supplies; selected communities supply the volunteers. This program has helped to revitalize communities across Oklahoma with a fresh coat of paint. Claremore Main Street and Back in the Day are among 43 participating groups working on chosen projects across the state. Claremore Main Street is dedicated to its mission to enrich downtown Claremore by promoting a healthy downtown economy and advocating for revitalization and historic preservation. It is a 501(c)3 nonprofit organization that was established in 2002. I would like to help out. Thank You!